30/09/2010 - The OECD today reappointed Angel Gurría to a second five-year mandate when his current term finishes on 1 June 2011. The decision by the OECD’s governing Council, composed of 33 member countries, constitutes an endorsement of Mr Gurría’s vision for the OECD as a more relevant, more open and more inclusive organisation. 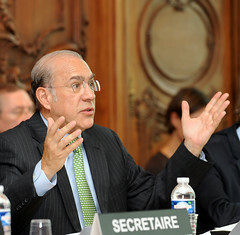 Portugal’s Ambassador to the OECD, Eduardo Ferro Rodrigues, the Dean of the Council, said the consensus decision reflected the “high regard” member countries had for Mr Gurría’s “energetic leadership” and reflected their confidence in his ability to lead the Organisation during the next five challenging years. In the context of the economic crisis and changes in the global economy, Mr Gurría said the OECD has to redouble its efforts. “The pursuit of relevance continues to be my guiding objective in order to improve the well-being of our citizens and help design better policies for better lives,” he said. Mr Gurría said the OECD has an important role in helping to rebuild the confidence of citizens following the massive governance and business failures that lay behind the crisis. “The emergence of the G20 provides the OECD with an important opportunity to provide expertise on taxes, balanced growth, investment, trade protectionism, anti-corruption and job creation”, said Mr Gurría. He also renewed his call for the creation of a network of international institutions to work more closely together on issues of global governance. He added the future relevance of the OECD also depended on a more effective and closer relationship with the emerging economies of Brazil, China, India, Indonesia and South Africa, as well as a successful conclusion to the OECD’s ongoing negotiations to welcome Russia as a member. For further information, journalists are invited to contact the OECD Media Division (news.contact@oecd.org; tel: + 331 4524 9700) and visit www.oecd.org.